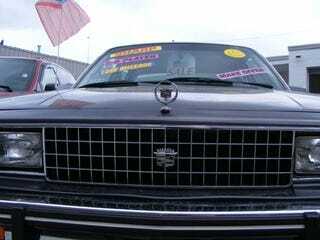 10K Mile '81 Cadillac Cimarron For $8,995: Nice Price Or Crack Pipe? A decisive 85% of you felt that the $39,975 Iran Khodro Paykan Deluxe required a major helping of Hubba Rocks to look like a wise investment, but today's choice might be more of a dilemma. Yes, the Cimarron was a total disaster for Cadillac, diluting its brand at the worst possible time, but that makes it a historically significant car… and Pixel has found this super-original, low-mileage example in a used-car dealership with an $8,995 price tag. You might be looking at the best Cimarron on the planet here; check out Pixel's Flickr sets, then make the jump to read his comments on this fine Cadillac compact and vote in the NPOCP poll. I saw this a week or two back at a Worcester MA car dealership and thought it might be right up your alley. It is an near-perfect all-original (less CD player) 1981 Cadillac Cimarron with 10,500(!) original miles. It may be most perfectly preserved example of the worst Cadillac ever. They were asking $8,995 for it.